Being an affiliate marketer, I can appreciate the fact that there are tools and platforms that can simplify processes, and make your life much more efficient as an affiliate. As a result, I want to spend some time walking you through the most powerful tools that you can leverage within your affiliate marketing business, but also explain why they are of benefit. I see far too often people trying to force tools and expenses into their business, including WordPress plug-ins, including software, and including systems that they simply do not need (and that are a waste of money). The tools that I am pretty showing you are completely free, and they can absolutely have an instant and positive impact on your affiliate business. Affiliate Marketing is Not Just a Process. What thing that you have to be careful as when you get deep into the affiliate world, Is that you do not get lost in the process of what you are doing. There’re far too many marketers out there that have a tendency to want to automate their businesses, and ultimately removes himself completely from their businesses because they feel as though they are too good to do some hands on stuff. I too fell into this trap several years ago when I tried to outsource every aspect of my business, and I felt I was too good to actually communicate directly with my audience. As crazy as that sounds, there is then natural tendency to want to try to move to the “4 hour work week” mentality. The reality though, that is not REAL. So I want you to make sure that you never remove the actual human element from the affiliate marketing business that you are running. There are tools that you can leverage in parallel with your actual interaction with your business, and that can make your life more efficient, but there are certain things that he should not attempt to automate. Your website and your business will move into a critical failure mode if you try to automate any of these elements, or source of off to some “amazing affiliate tool”. So be careful in that respect. But there is good news. There are many things that you will be able to automate, to speed up, and to compartmentalize within your affiliate business. Analyzing Your Affiliate Business First, Then Automate. Sometimes the best way to army your business, is the first analyze your business and their process. What are some things that you’re doing on a regular basis, that you feel are far too manually. It is safe to see if you are writing something down, chances are it could be automated. Also, if you are spending a lot of time in your daily activities doing one thing in particular, then this can also likely be sourced out to a tool. Some main items that I tend to focus on when it comes to automation and streamlining processes are (but not limited to). There’s a large subset of tonics with in view categories that can definitely help your business, but when starting out you are going to want to do so in the most cost-efficient manner (that is, free, or very close to free). There are literally thousands of affiliate tools that you can utilize within your business. Over the years I have probably tried 100’s of them. Some brilliant and some a complete waste of energy. The save you from the “trial and error” of all the tools out there, I want you to be able to piggyback my experience within the industry and my last 16 years within the affiliate marketing world. Wealthy Affiliate. If you’re looking for the elite education, yet the most cost-efficient and away to get started with your affiliate marketing education, there is no other option that you should be considering. There are 1,000’s of resources, and over 1.4 MILLION Aspiring and very successful affiliate marketers with in the back office of Wealthy Affiliate that will be more than happy to help you out. There’re two membership tights, one being completely free starter membership, the other being the Premium membership. By all means, if you are not already part of Wealthy Affiliate and you are ANY level (newbie to expert), you should at the very least be operating your affiliate marketing business with a starter membership working for you. This is also where you can find me personally hanging out and helping people achieve success with their respective affiliate marketing businesses. In fact, if you’d join the free membership, I will be more than happy to coach you personally and help you overcome any hurdles that you may have in your journey to success. Being able to properly research keywords, niches and analyze websites is a critical component of success was absolutely any affiliate marketing business, and you need the right tools in place to do this. Affiliate Tools that offer quality, reliable and useful data are hard to come by in this space And oftentimes it can be incredibly expensive, upwards of $1,000 per month. 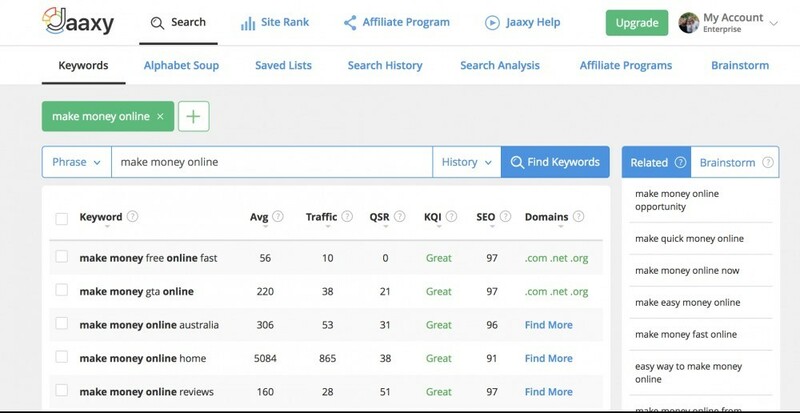 Within Jaaxy you will be able to accomplish all of your affiliate marketing research activities, from keyword research, finding low competition keywords, finding and buy domains, managing keyword lists, analyzing competition, affiliate programs, brainstorm and idea generation and being able to track where you are ranked in all search engines. Get 30 Free Jaaxy Searches Here! Managing passwords can be frustrating and very time-consuming as an affiliate marketer. You are going to be joining a lot of services, using a lot of different products/tools, and joining lots of different affiliate programs. You want to centralize the management of all of these and you can use LastPass for this. . There are some browsers that are better than others with managing passwords, but none of them do as effective of a job as they should. Because of this, I use Last Pass. It is a plugin that you can add on to both Safari, Windows and Google Chrome. The foundation of any successful business online starts with a website. As an affiliate marketer you want to carefully choose what company you use for your website platform, including the hosting aspect. There are many options out there, and they are not all created equally. There are also many website platforms that you can use for completely free, but they are not all created equally either. You have probably heard of WordPress, Wix, Web.com, they all have decent platforms, but there are lots of advertising on your free websites and they limit your ability as an affiliate marketer. All hosting is not created equal either. You want to use Managed Hosting where you have access to proper support, and hosting that you can rely on in terms of speed and up time. Because of this, I recommend you utilize the SiteRubix platform within Wealthy Affiliate. If you create a Wealthy Affiliate account, you get TWO free websites that you can use for your affiliate marketing campaigns. As a Premium member, you get hosting for up to 50 websites. This includes over 10 website related platforms you can use for your business. Get 2 Free Websites w/ SiteRubix @ Wealthy Affiliate. Conventionally speaking, I am a paper and pen sort of guy. I love to write out my daily task, there is something about being able to put my agenda on paper that makes it easier to manage. Just a personal thing. I had tried moving my task management to Evernote, but I just didn’t love it and I found myself not using it like I should, it may have had too many features. Until I found Trello. This platform is AWESOME, it is free and it has lead to a lot more productivity in my day to day tasks. You can create projects, you can share and manage projects with others, and you can manage entire teams of people through the Trello interface. If you want to add efficiency to your day to day activities and have much better perspective as to what you are accomplishing, I recommend you get yourself an account. Get a Free Trello.com Account here. To be a content marketer, you need to have an environment that is conducive To efficient writing, but also encourages you and motivates you with proper goal setting. SEO is the fundamental Foundation for most affiliate marketing businesses, and content is the basis for any successful SEO campaign. Having the appropriate tools in place for your writing efforts, and ones that offer you insight into SEO are imperative to your rankings. There are a few tools that I recommend in this space, both of which offer free versions and are very high quality. Both of these tools are available to you for free, and I recommend both of them. They will be KEY in your affiliate marketing businesses as content creation is a big part of your business. Although there is no such thing as a “free autoresponder”, there are companies out there that are offering a free trial. One of my core recommendations is GetResponse.com. There are many advantages to using them, but one being that they have “lead pages” that you can create right within their platform. Get your free GetResponse trial here. Affiliate links start to get out of control after you build out one or more websites, and it is nice to have a centralized platform to manage, mask, and even track your affiliate links. There is a completely free plugin that you can leverage within WordPress for your link management. It is really great affiliate link management tool. What a powerful platform thinking want to affiliate is Wealthy Affiliate. What is unique about this is that it is an all-inclusive environment for creating, growing and managing your business. With over 1.4 million, you have the most active community and platform for coaching, help, and also an environment that you can leverage to create partnership, build a network, and also build a following. Any confusing how to manage a bunch of different tools within different environments, and it isn’t even more difficult when they don’t speak to one another efficient manner. For example, when it is nice for your website platform to communicate directly with your hosting platform, which would be able to communicate directly with your support channels, your keyword and research platforms, website analysis, and your content platform. That is the capabilities that are offered to you with in this all-inclusive environment, and I like all the other platforms mentioned above (Many of which are included within the wealthy affiliate membership), it is completely free to try, use and build your business from. I am very active within this platform, I run several businesses, and I am also actively helping people within the community throughout the day, every day, accomplish the same thing. 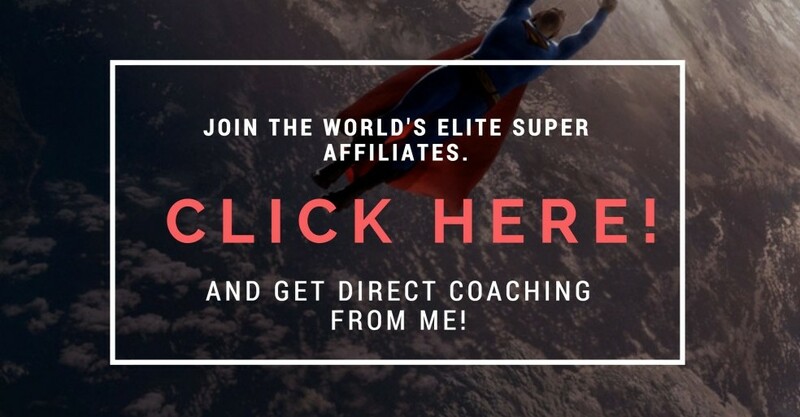 If you want my personal coaching in access to the only all-inclusive environment for building an affiliate business, I really do recommend you consider at the very least setting up a free starter membership. So there you have it. These are tools that are recommended for your affiliate business, and affiliate tools that will allow you to bootstrap your business. Conventionally speaking, the Internet business used to be a lot more expensive in terms of start-up costs. This is almost been minute mile next to nothing and you can truly operate a very successful business on a budget of less than $500 per year. Do you that you need to make sure that you are making the best use of the free tools and software out there, spending money where it matters and where it benefits you (on the websites, coaching, hosting, etc), And also not always your money on overpriced education or services that you can get for free or much cheaper elsewhere. I hope this is offering you a great deal of insight, but also ends up helping with your affiliate marketing ventures moving forward. If you have any questions about the affiliate tools I use, or you would like to offer up some other tools that you use in your business that are free (or very low cost), I recommend that you leave these below. Great tools to have in the Affiliate Marketing space. Keeping up with so many passwords, you mentioned LastPass. I would like to add Dashlane as an alternative. I have been using Dashlane for many years now, and find it to be very fast, effective and free. With a premium account, your passwords can be synced to multiple devices. Here is a link to Google Chrome. Thanks Rolland, I haven’t heard of dashlane for password storage, but I definitely will check it out (and perhaps recommend it to my readers as well). Thanks for chiming in and offering a free tool that you love to use! Wow! There are so many tools in this one program, and I love the quality they come with. I have actually been looking for a program that would help learn the basics of affiliate marketing for around $100 a month but I see this is much cheaper and better than what I wanted. It means I won’t have to pay for keyword tools and writing tools at all. Let me check out the free version first to get well acquainted with it before committing myself fully into it. The services can really start to add up if you don’t know where to look. I have worked with folks over the years that are spending $1,000’s per month to operate their affiliate marketing business. It’s crazy. There are definitely cost efficient and FREE platforms out there that you can leverage, and I have outlined some of my favourites (although there are others that didn’t quite make the list but probably will make another down the road). One other platform that I absolutely love using these days for all types of images development (headers, logos, banners, graphics, fb covers, etc) is Canva.com. It is a brilliant platform and it is free as well, I will likely be doing an entire post on this as it can really serve a big benefit to any affiliate marketers business. Kyle, As you stated early in your excellent article, being an affiliate marketer is not something to be done by an individual on a limited or part-time basis. A person in order to achieve financial success in his/her online business would have to come close to putting in 30 – 40 hours per week much as if it being practically a full-time gig. I believe, in addition to not having the proper marketing tools such as is offered at Wealthy Affiliate (and highlighted individually in your article) the above kind of mindset in which a person treats running this type of online business as only a hobby will eventually lead to nothing but failure. It’s no accident that Wealthy Affiliate is the absolute BEST such educational training and community support platform that exists on the Internet. Through the 8 marketing tools that you discussed in the article (only 3 – Last Pass, Trello and Get Response email marketing not offered directly by WA as part of their membership tools) I believe that incorporating them into one’s business would allow a seriously motivated individual, done over time and not as some get-rich-quick stunt, to achieve financial success in his/her online business! Btw, in my opinion the training, (tool #1) keyword research Jaaxy tool (#2), website building/hosting platform (#4), Sitecontent writing tool (#6) and Pretty links feature (#8) all but a part of what is offered at WA considering the cost of being a premium level member is unmatched by any other training site that exists in the entire world! Thanks for your feedback here and perspective. As I was creating this post, I realized that many of the platforms that I have come to use “second nature” in my day to day business activities are all included here within WA. There are many different elements to creating a successful affiliate marketing business that we forget we take advantage of. Many are free, and many are completely available to everyone with any budget. I am a proponent of bootstrapping and starting a business at the lowest cost possible, and FREE affiliate marketing tools are out there and in the case of Wealthy Affiliate, you have a complete environment for building an affiliate marketing biz under one roof (and lots of free tools). Thanks for the advice Kyle. I am with you and agree that Wealthy Affiliate is fantastic! I am intrigued by Trello and Last Pass so I will take your advice and check them out over the next few days. How secure is Last Pass because our passwords are pretty important really? Last Pass is secure and the details are stored locally in your browser in a fully encrypted manner. They actually have a page on their website dedicated to security if you want to check it out. And you can set time frames and calendar your tasks. You can also invite others to take part in your tasks, and you can mark task complete as you are working through them. I use this both for my business and personal related tasks and it has kept me much more organized. In this modern era’s time scarcity, being able to automate your affiliate marketing process is manna from heaven. I have tried most of these tools and I have to say they are all pretty amazing. The only ones I haven’t tried (yet) are Trello (I use another tasklist tool called Todoist), GetResponse (I haven’t created an email list yet) and Pretty Links – I’m gonna try this, sooner or later. I like Grammarly, Jaaxy (although my niche doesn’t have a lot of keywords to work with) and SiteContent. Thanks for a great article with so much information! There are certain things in your affiliate marketing business that you will not be able to automated, but there are many things that you can. When I think back to when I started out within the affiliate marketing world (back in the dark ages now, 2002), almost everything I did was manual. From building a website, from building menus and themes, task management, affiliate password management, etc. I had piles of paper on my desk at any given time, with scribbles and scratches all over them. These days building an affiliate business is faster than ever, more efficient than ever, and you can be far more organized. And with mostly free tools! What an incredible time we live in right? These are all great marketing tools. I like it how most of these tools are from Wealthy Affiliate. You simply get everything you need to run a business in one place for a very low price. Some people spend way too much money on tools and services without looking for any cheaper alternatives. Most of the time, if a tool is quite expensive, you could probably find something cheaper and maybe even better. Those are some great tools. I haven’t tried them all yet, but I love the ones I have tried. Trello has been my favorite out of all of them. It keeps me on task and I never forget what I need to do everyday. I love that you can easily switch things around too, making it very flexible. I love Jaaxy too, it makes the keywords research so much quicker than going to google and trying to figure out which words would be good on your own. I haven’t heard of LastPass before though, and that sounds way better than trying to remember all of my logins. Definitely going to be checking that out right away. Thanks for sharing! Trello Just ran a significant update, and it is a really awesome one. I not only use this for business related tasks, I use this also for my personal life tasks and scheduling. It definitely keeps me organized and although I never thought it would happen, it has shifted me away from using pen and paper (which I thought would never happen). Jaaxy is my go to for keyword, niche and website research. It is all encompassing. It was built for affiliate marketers, by affiliate marketers which is something that most of the research tools and platforms have not done (they don’t truly understand affiliate marketers). Hey. I’ve been interested in a long time affiliate marketing, but I’ve always had some reluctance to take action. I was afraid that all this might overwhelm me. But I did not expect that there are so many amazing tools that make it all easier. This post encouraged me to try my hand at affiliate marketing. Would you recommend a way to get free photos for the blog? Thanks. Action will lead to success, with anything you do. Just remember that Michael. I often see people like deer in the headlights simply because they are fearful of failure. The greatest failure is the result of inaction. And failure is a requirement to any form of success in any form of education. In respect to your question, there’re many resources out there where you can get free images. Being a member of Wealthy Affiliate, you will have access to over 1+ MILLION completely free CCO (Creative Common Zero) images that you can use on your website. This covers absolutely every niche and is included in the premium membership. That is one option. There are also many sites out there that you can leverage to get images, Pexels.com and Unsplash.com are amongst the most common and you can leverage those to find and download images (which you can then insert into your website). I don’t recommend using royalty free websites for finding images, simply because many of these images are copywritten and you can get in trouble for using them on your website. You always want to use CC0 images as these can be reused within your content in any way you like, without attribution. Great list of tools, I tried lastpass but much prefer roboform, I suppose it’s what I’m used to. Lurve Grammarly – I should use it more often TBH, as my grammar stinks! Roboform is another good one for storing passwords. I becomes down to a matter of personal preference, lastpass an RoboForm are both very popular and free platforms for this. I know that grammarly would have certainly caught the LURVE error there, lol. Thanks for chiming in and offering us insight into the free affiliate marketing tools are using Tony. Hey i really liked this article and it was very informative. You listed a lot of great tools and i know there are a lot of areas i need to improve in. I need to get better with my keyword rankings and i have started to do extra stuff like write an ebook, so i can offer it to people who joins WA under me for free. I may have to write out a plan myself so i know what i need to do.